What was life like for the rural poor in 18th century England? Just as new agricultural technology was replacing farm workers with machines, medical advances were improving life expectancy. The result in rural Suffolk was a scarcity of employment that left many without the means to support themselves or their families. In this fascinating glimpse into community action at a local level, Victor Peskett reveals the workings of the Guardians of the Poor in Metfield, a village committee with powers to levy a charge on the community and, after close examination, disperse funds to support the poor, according to their needs and their means. This title is now available as an audiobook, so you can listen to it in the car or on your phone, tablet, computer or other MP3 device. The book is beautifully read by Kate Shrewsday. You can download the audiobook here. 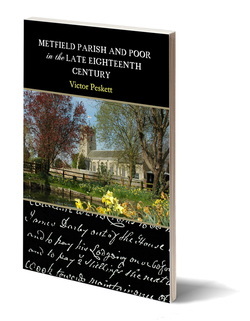 Aug 2018: Adding paperback sales, ebook and audiobook downloads, Metfield Parish and Poor has now achieved a readership of 2,200. 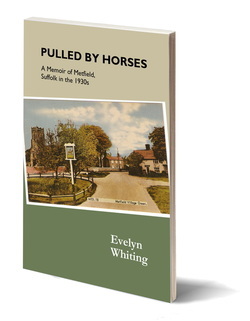 If this sounds just too idyllic to be true, Evelyn Whiting’s charming memoir of the time she spent growing up in this rural Suffolk community is quick to remind readers that making a decent living from the land was hard and tedious work in those days. There was no electricity, and water came from the sky, or from the pond. Evelyn's book is also available in audio format, sensitively read by Virginia Ferguson, for enjoying on any MP3 device, such as your phone, computer or in your car. Profits from sales of all formats go to Metfield Church, Suffolk.